← On the River at Kinabatangan. Sabah. Borneo. Cats and Cakes in Kuching, Sarawak. What’s it like in Borneo you might ask? First let me say I’m amazed that two friends have been here, Judy, Susie, and I never knew. It’s so far away from everything, there’s this little brain cell constantly saying ‘when are we going back?’ I’m further from the great Eurasian/Americas landmasses than I have ever been and its both liberating and just a bit unsettling. ( Ok, forget Hawaii) The people too, perhaps sensing their remoteness, are very different, good natured, interested in why I’m here, and proudly individualistic. There are sights on the street that stop me in my tracks, long haired youths with the crown dyed blond, young women wearing their colorful hijabs with black patent leather stilettos and was that really an ankle tattoo? Every other door on the street is a cafe or restaurant and they all appear to be packed all day and late into the evening. I’m sure it, like many other places, could be described as a Foodie Heaven, but lets just say these people sure do enjoy their food. Big, did I mention its big, it’s one third bigger than France, it’s about the same size as Texas and you know what they say about Texas. Borneo is third biggest island in the world after Greenland and New Guinea. Getting about is challenging because they have this rainforest, the oldest in the world, not to mention impenetrable mountains and vast rivers. In the south in Kalimantan there are no roads through the interior and most of the getting about is got about on rivers, something to look forward to. They use British power plugs, you know, those big ones with three prongs. Always a bit of a mystery to those coming from far away but, God bless her, Julia gave me a compatible adaptor for Christmas and I delight in it every day, it just works, plus it is small and light. Again, the car registration plates start with SAB, well of course, it’s Sabah. Markets and more markets, a Sunday market right outside my hotel, a nightly one outside the Le Meridian hotel, malls but not your usual glitzy nightmares, no, these are full of booths selling everything you can imagine, and, the young Muslim women who staff many of them shut up shop regularly and head off to pray. Quite enchanting. Talking of young Muslim women there was a bit of a sensation in the local press over the Chinese New Year Holiday. It seems that supermarket managers scheduled aforementioned young women to work on the booze counters. A complete no, no, so they complained to the local paper and a mild uproar ensued. Of course they had the backing of the local populace and won their point. No more working on the booze counters. Good for them. Banks, did I say banks, they are as prevalent as coffee shops in Seattle. Some intersections have four, one on each corner and there are queues outside them all. Why? I don’t know, it’s not a tax free haven though I think it might be a cash economy, maybe it’s all the restaurants and cafes. To accentuate that I just read in today’s Borneo Express that the average Sabah native eats six large meals every day. Six! They all appear Sylph like, it must be the climate. I have moved on, from Sabah to Sarawak another of the Malaysian States on the Island of Borneo and time has passed, sorry about that. But really there is not a lot to comment on about Sarawak. I’m sure it is probably rude and offensive but it is surely one of the World’s greatest backwaters. Absolutely nothing happens here and it is a fabulous place to visit if that is what you like. 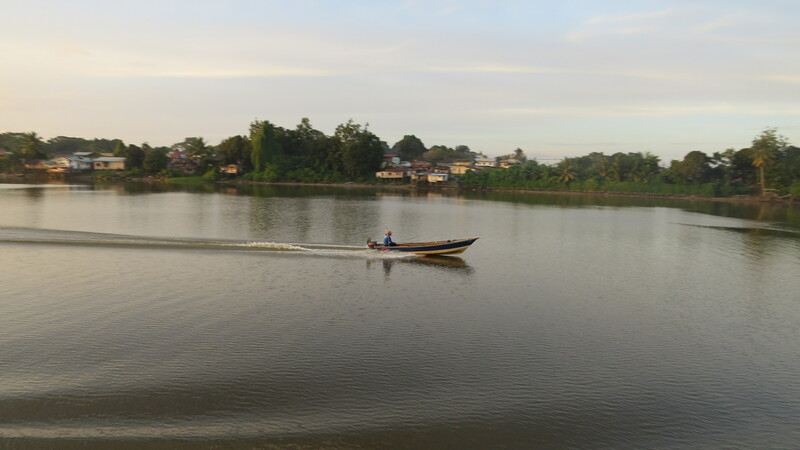 Here in the capital, Kuching, there is a wonderful river, the Sarawak, threading its way through the center of town crossed by sampan passenger ferries, a one way trip costs a dime (7P). It’s wonderful to sit on the riverbank for hours and watch them colorfully crisscrossing back and forth, like I said, not much happens here. I did take myself off to the coast for a few days hoping to see the World’s largest flower, the Rafflesia, but alas, none were flowering. 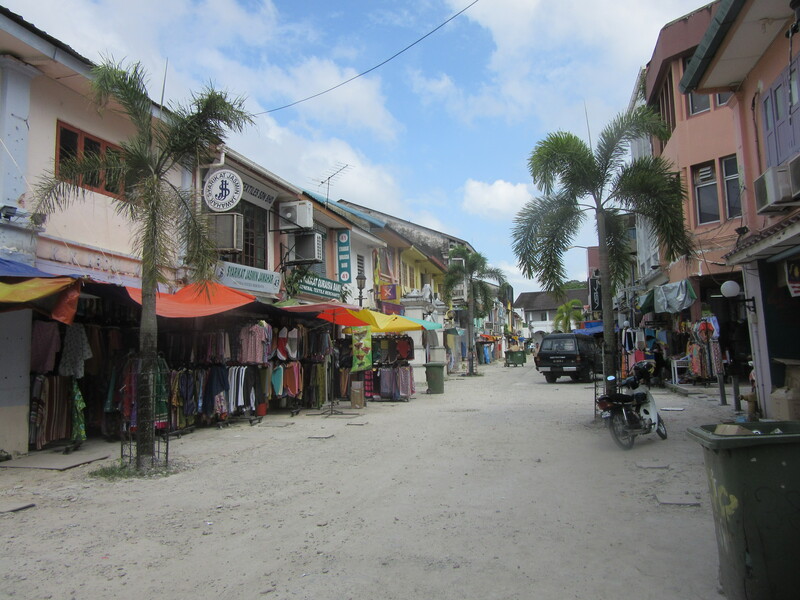 Again not much happened out near Lundu (I liked the name), there was a huge beach with barely a soul on it, fishing boats out on the South China Sea, King tides due to the full moon, it rained, but all in all, there was nothing to do. I caught the bus back here to Kuching. Before you think badly of me, and of Sarawak, I will tell you this. Such as it is known at all, anywhere, it is known for its cats and its cakes. Yes, really! 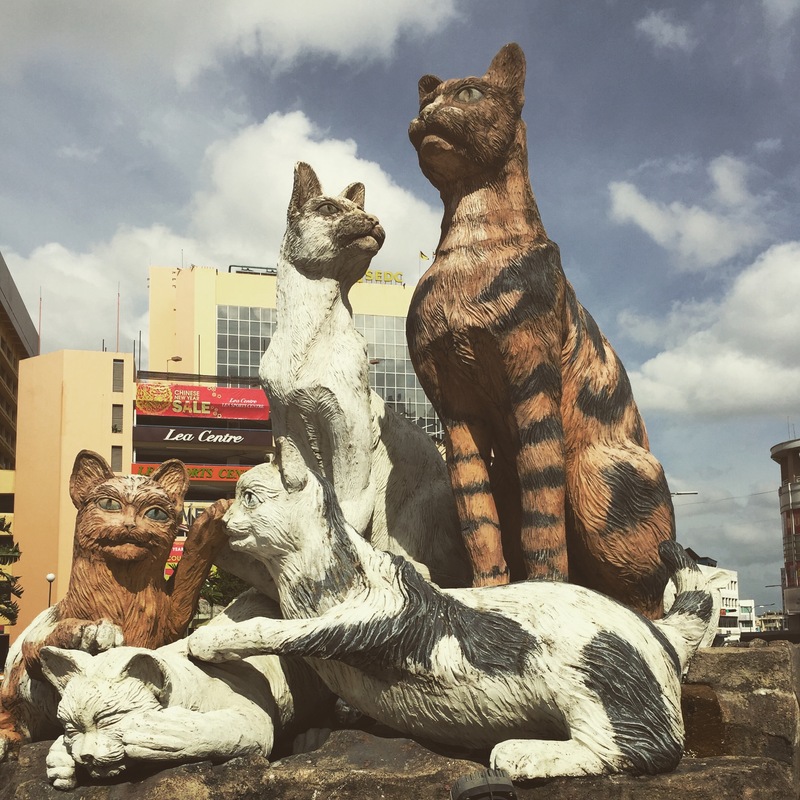 Kuching’s nickname is City of Cats derived from the Malay word for cats, kucing. There is a tall cat obelisk just up the street from my hotel surrounded by large white cats. 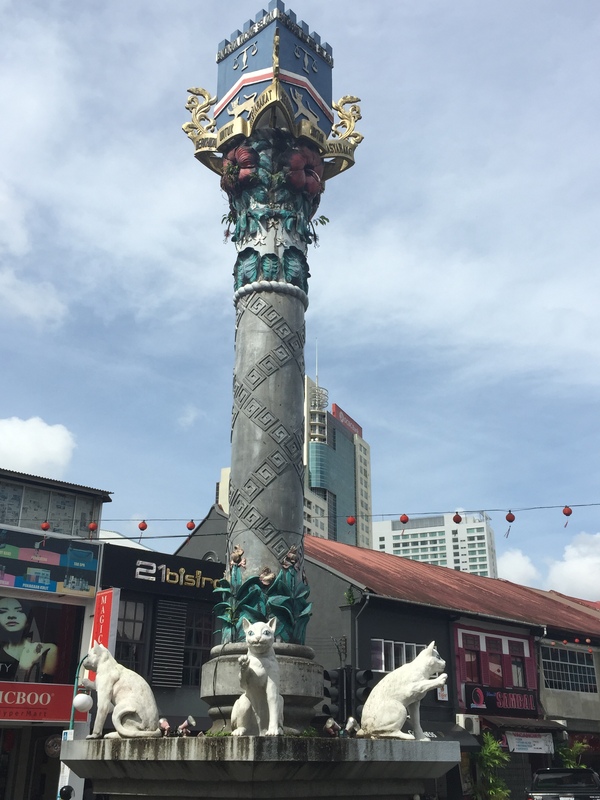 In the middle of a traffic island in the city center is a huge statue featuring many cats and outside China Town, another, huge solitary cat. People have cat sounds as their cell phone ring tone. There are smaller cat effigies in the public parks for kids to play on and around and of course real cats abound though what is done to their tails I don’t know, they all seem to have a small knot instead. It’s not all boring then! Then there are the cakes or Kek Lapis. A specialty of Sarawak this type of layer cake appears everywhere and people buy it by the crate load. 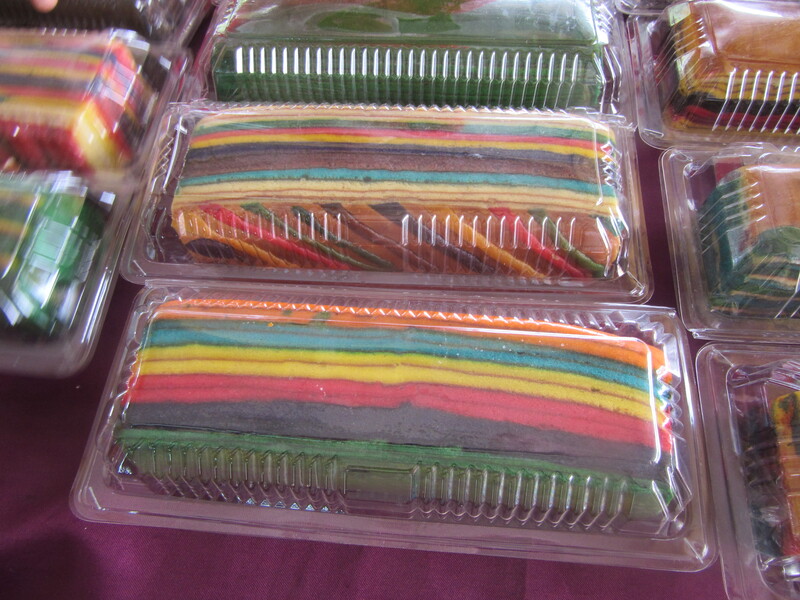 Very colorful, each layer different, they take up to six hours to bake mostly in people’s homes. So many different flavors in one bite and the stall holders proudly give away free samples. Visitors from the mainland buy it in bulk to take home. Sarawak has its appeal and while writing this I have decided to stay an extra few days and go look for that elusive flower. 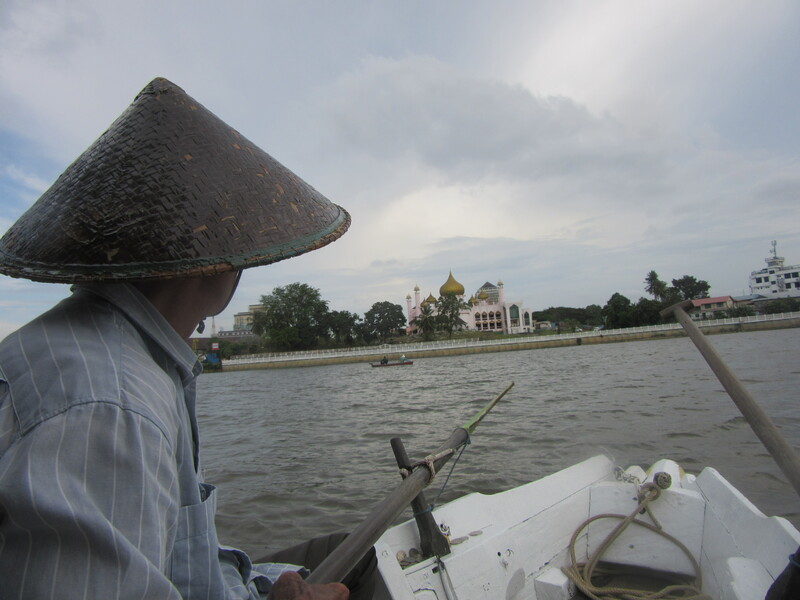 On the Sarawak River. Kuching. This entry was posted in Uncategorized and tagged City of Cats, kek lapis, Kuching, Sarawak. Bookmark the permalink. Maybe I was a little harsh on Sarawak, pronounced with a rolled R and the emphasis on WAK. Sitting beside the river really was enchanting, especially watching the very few Westerners reading their guide books and scratching their heads wondering what to do. The Prime Minister came for three days and you have never seen such chaos, security schmerucity. I’m sure you will come here…. one day, and like me, wake up every morning saying ‘Borneo’? Really? A blog at last, glad all is well and you have been chilling by the river. 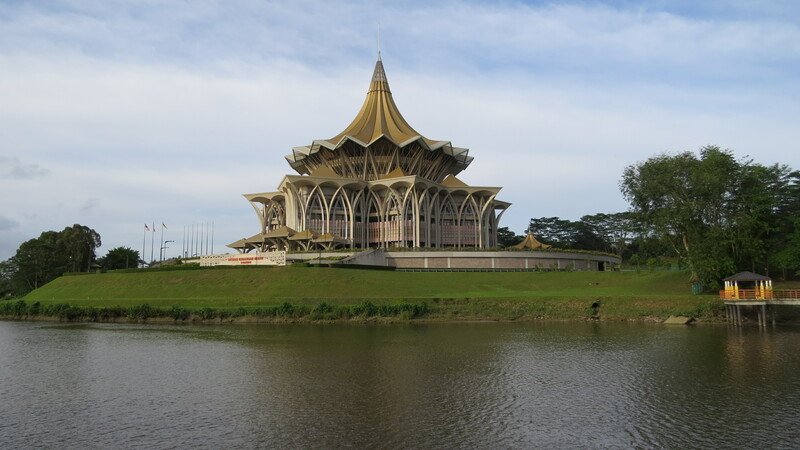 Sorry it took a while but Sarawak was a bit of a blog challenge. How to write about not much to do. The closest I got to the flower was the ones memorialized at the top of the cat obelisk, but I am still looking. Tim, good to hear the latest and news of the women’s protest. It sounds quite modern underneath old world garb. The photos really bring it all to life – – my favorite is the City Hall. It has to win the contest for most extraordinary in the world. And Franky is most gratified to know that he has a monument on the other side of the planet! Glad you like the photos. Interesting to note that I use my phone almost all the time and have to really try hard to remember the camera. I wish Nora, I wish. Life in KK is so much easier than it is here. Thanks for the offer tho. Welcome back! Lovely to read your blog and see the photos. Love the cats, but not sure of the Dayglo-coloured cake… Like Victoria, I am all agog to see the Rafflesia. No pressure or anything. What was so great about the cakes was how proud of them the stall holders were. There’s still hope for the flower, they are endemic to the whole island apparently. I am told the best way to find them is by their smell, which is absolutely appalling. Not only that, but when they wither away after five days they turn into black slime. Shame about the Rafflesia, I tried, I really did. I agree, the dayglo cakes were a little discouraging, for me, but there as no shortage of punters. Sometimes Sebastian it really does seem like another Planet. Glad you like the posts and keep reading the National Geographic mags. Cakes? Organic? I really doubt it. Not much in the way of organics here in South Borneo.